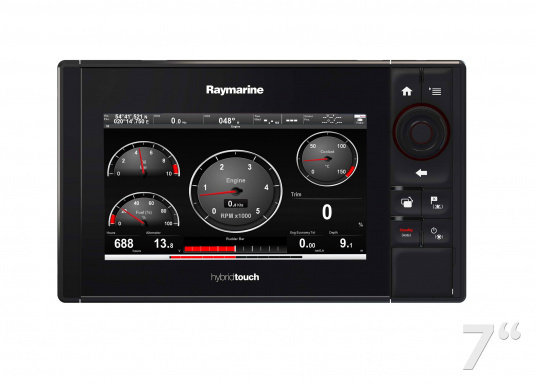 The Raymarine eS78 multifunction display features high-speed processors, a super-bright hybrid touch display and a variety of connectivity options. You have the freedom to choose between the best cartographies and the innovative multi-function knob ensures precise and easy navigation in all weather conditions. 599,95 € IVA incluido, gastos de transporte excluido. 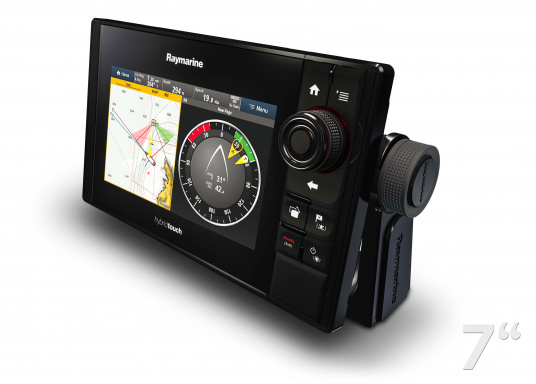 Ideal for small and mid-size boats and yachts, the Raymarine eS78 chartplotter gives you full control over sailing and your engine with the advanced LightHouse operating system with HybridTouch ™. 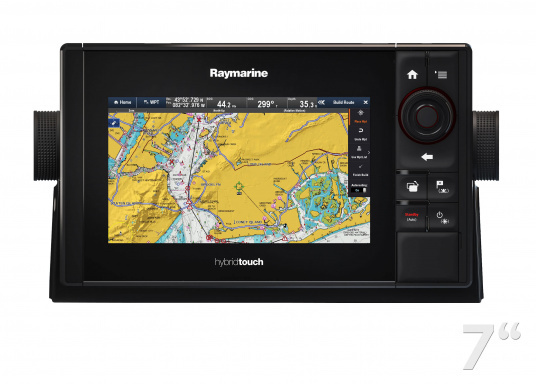 Raymarine HybridTouch ™ technology offers you the choice of intuitive touchscreen interactions with pinch-to-zoom or full keyboard control in rough seas. 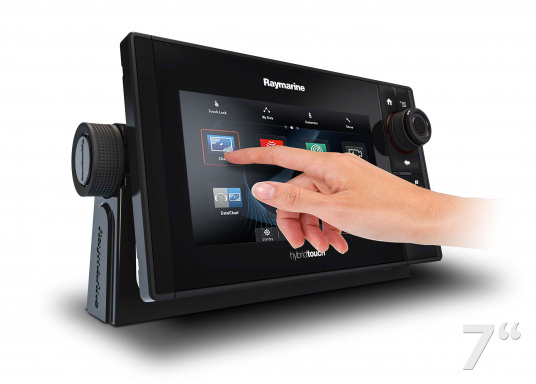 For example, new routes are quickly planned via the touchscreen, while you do not have to sacrifice precise key operation by using the multi-function knob. 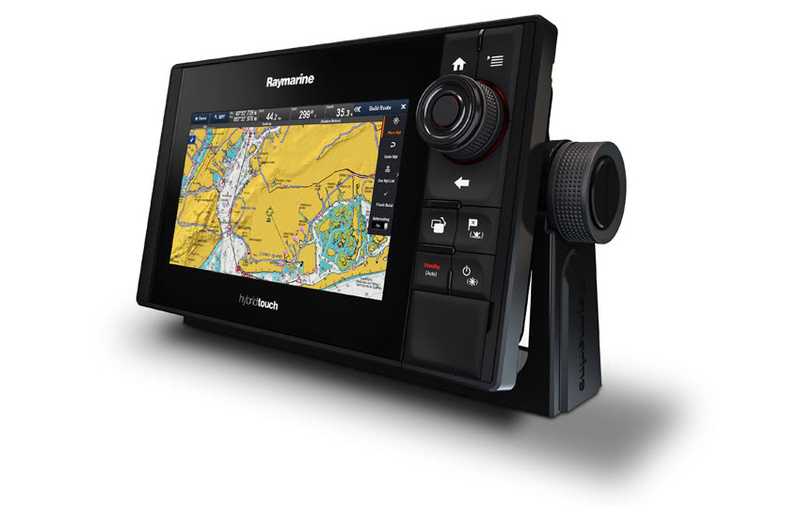 The integrated 10 Hz GPS receiver combined with pinch-to-zoom technology of the multi-touch display make the Raymarine eS78 a fully-fledged chartplotter, while allowing you to take advantage of Navionics and C-MAP Nautical Charts. The eS78 has two micro SD card slots and supports up to 32GB micro SD cards. Take advantage of the latest chart features such as Navionics Auto Routing and C-MAP Easy Routing (C-MAP 4D MAX + Nautical Charts only). 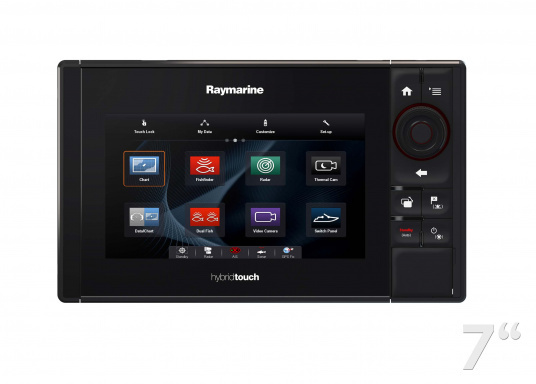 Thanks to the integrated WIFI module, you can mirror and operate the Raymarine eS78 with your smartphone or tablet or iPhone or iPad. 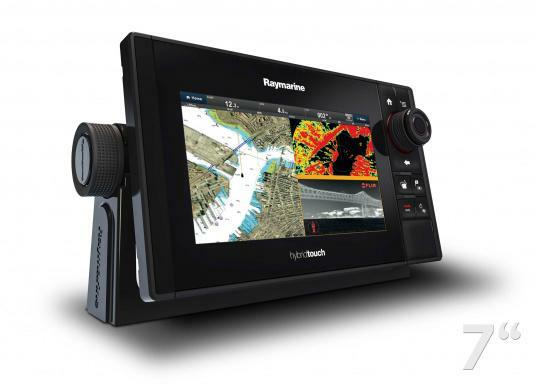 Just download Raymarine's mobile apps to your mobile device. 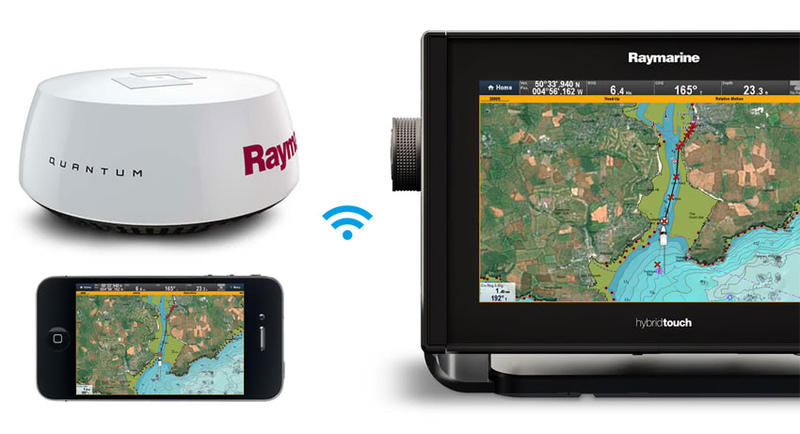 Furthermore, you can use a Quantum radar antenna to wirelessly connect to the Raymarine eS78. 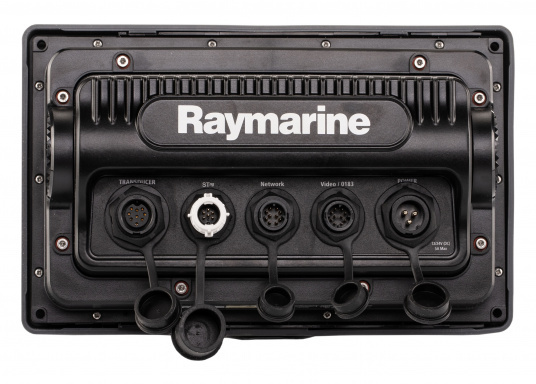 The Raymarine eS78 is equipped with a SeaTalkNG interface. This enables a simple network setup and the rapid exchange of data from a wide range of instruments and encoders. 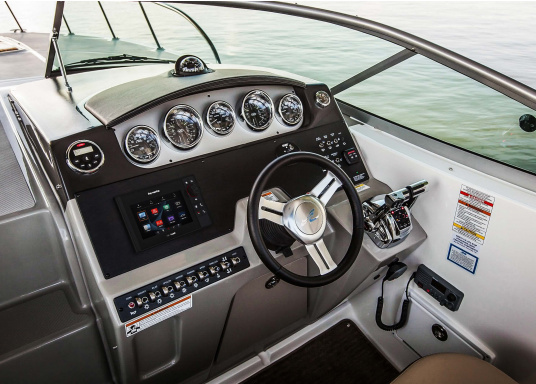 Control your Evolution autopilot conveniently via the autopilot control unit and the eS78. Plan new routes on the eS78 and send them to your autopilot using SeaTalkNG / NMEA2000. 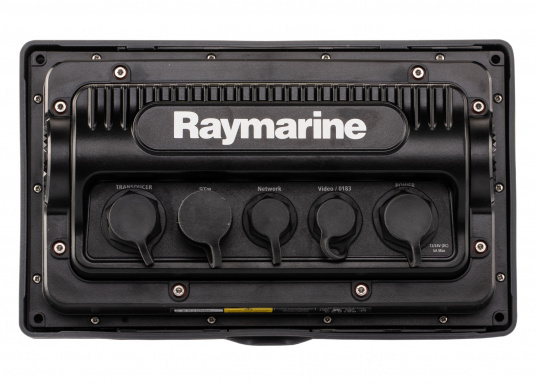 With the help of the Raymarine SeaTalk1 on SeaTalkNG Converter, you can bidirectionally integrate your old Raymarine ST40 or ST60 instruments into the SeaTalkNG network and display the data on the Raymarine eS78. 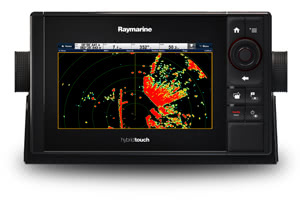 The NMEA0183 compatibility allows the Raymarine eS78 to connect to NMEA0183-enabled devices such as AIS, radios or external GPS receivers. For the use of the NMEA0183 interface, a NMEA0183 data cable is required (Art . : 21600). 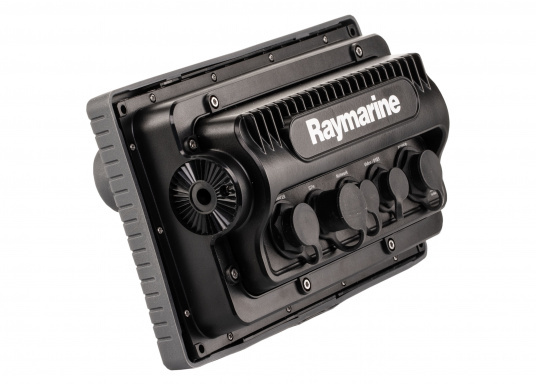 Ensure a secure connection by, for example, connecting a Raymarine Quantum radar antenna directly to the eS78 using Raynet. Alternatively you can connect two eS78 displays with each other. For example, sharing two eS78 shares the data of your electronic nautical chart. The following data is exchanged between the devices via Raynet. 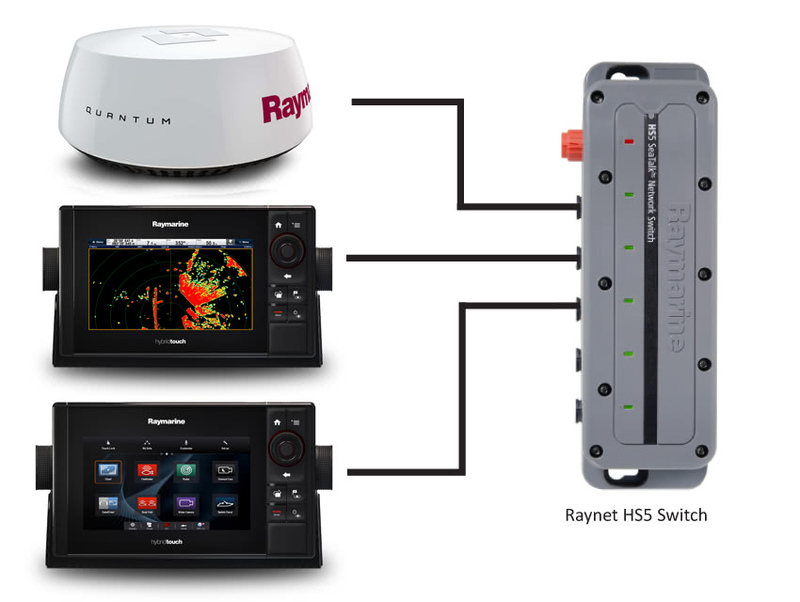 For the connection of more than one eS78 or the additional use of a Raymarine Quantum antenna is recommended the use of a Raynet HS5 switch. 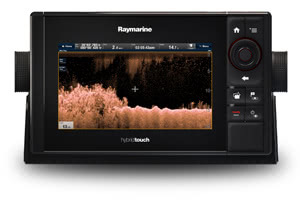 Fishing with the Raymarine eS series allows you to spend more time catching fish and less time searching! 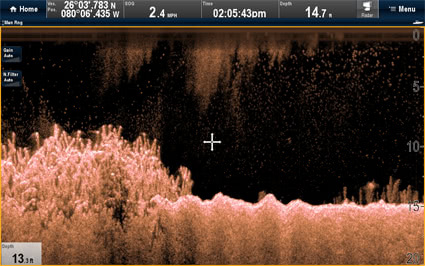 This is made possible by the integrated CHIRP DownVision ™ module (encoder / transducer optional), which delivers high-resolution underwater images. 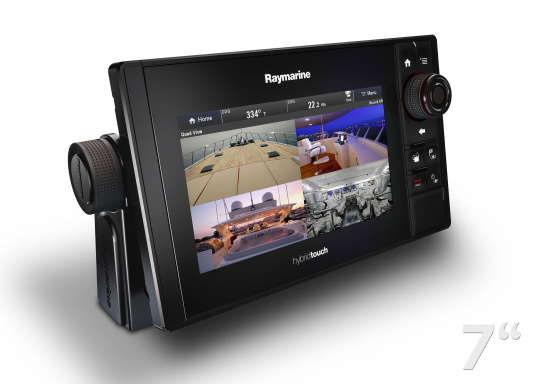 Onboard video with support for up to 10 IP cameras and an analog camera. View images from up to 4 cameras simultaneously. 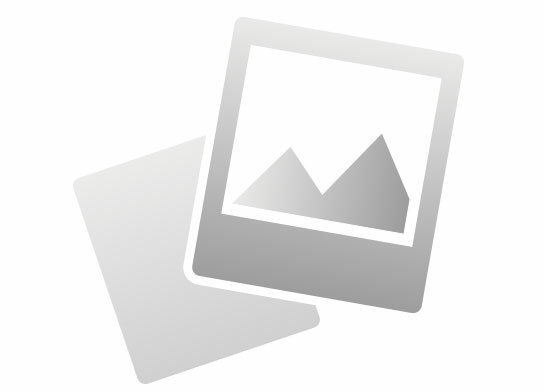 Record and take snapshots of your digital video stream. The eS78 devices are supplied with the LightHouse 2 software pre-installed. It is possible to update to LightHouse 3. Please note that it is not possible to install the LightHouse2 software after updating to LightHouse 3. Functionality of LightHouse 2 and LightHouse 3 is different. 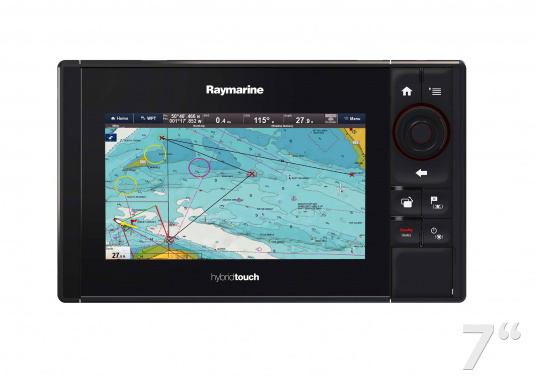 Detailed information regarding the differences between LightHouse 2 and 3 on the eS series can be found on the Raymarine Webseite. Dimensions 9.6 "x 5.7" x 2.6 "
L antenne GPS est elle intégrée ou faut il une antenne extérieure en plus? In addition to Arne's answer, I would like to add that raster charts are also supported by NV-Verlag and Delius-Klasing as well as NOAA raster charts. 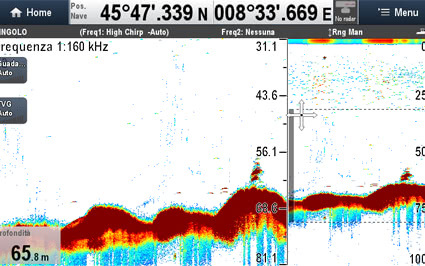 These must be downloaded from the Raymarine chart store. Thank you for your response. 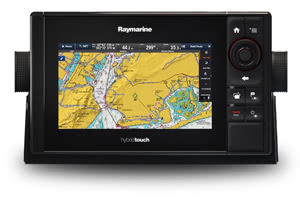 Unfortunately with the added expense of the navionics card it takes it out of my budget. 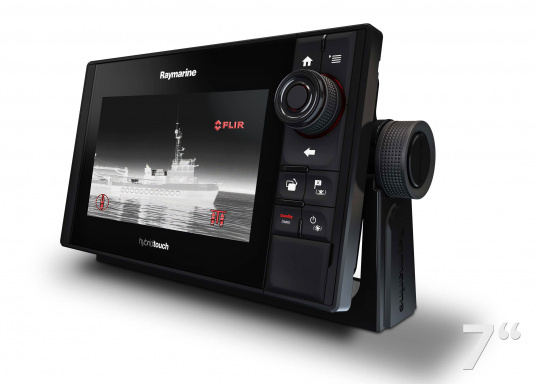 Bonjour Peut on installer ce lecteur de carte en fixe à l.exterieur du bateau (Pour ma part sur un first 30 e au dessus du roof? Le traceur de cartes est étanche et peut donc également être monté à l'extérieur. 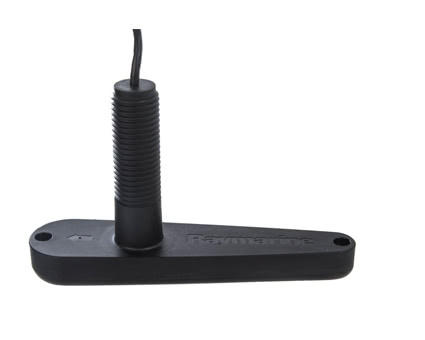 Ist das Gerät kompatibel mit meinem Benzin-Durchflussmesser von Garmin GFS 10 NMEA 2000 /CANet? Wenn nicht, welcher Geber ist dann zu empfehlen? Wenn aus dem Garmin-Durchflussgeber NMEA2000-Daten herauskommen, kann der eS-Plotter diese Daten anzeigen. Sind Kalibrier- oder Einstell-Schritte notwendig, ist dafür in aller Regel ein Display des Geber-Herstellers notwendig, da jeder Hersteller für diese Vorgänge hausinterne proprietäre Datensätze nutzt. Ma l'eco scandaglio è compreso o si compra a parte ? la carta del mediterraneo non è compresa? per l'antenna? Can i choose Greek as main language? Is greek available? Greek is available in both LightHouse 2 and LightHouse 3.
bonjour est ce que la sonde extérieure ref A80351 correspond a l a Afficheur multifonction eS78, est ce que le module sonde est intégré dans Afficheur multifonction eS78. est ce que le cable de la sonde exterieur se raccorde directement au l afficheur. Sie können NMEA2000-Daten direkt über die SeaTalk-NG-Verbindung des Kartenplotters einspeisen, die von Werner P. benannte Leitung ist für NMEA0183-Daten notwendig. 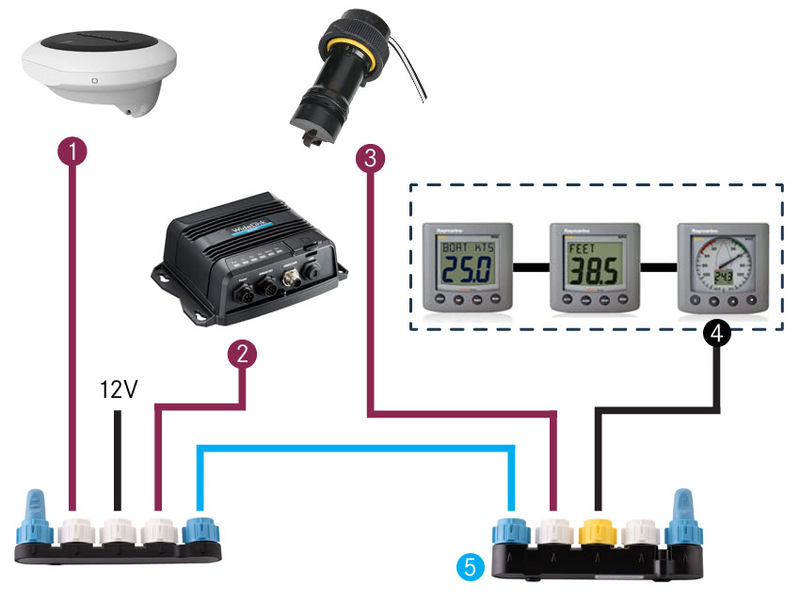 SeaTalk-NG ist die NMEA2000-Version von Raymarine, Sie benötigen also eine Adaptierung von SeaTalk-NG auf NMEA2000-Devicenet. 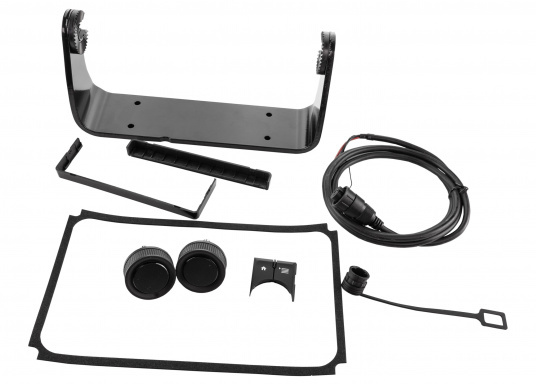 Raymarine bietet zwei Adapter an. Benötigen Sie auf der NMEA2000-Seite eine Buchse, ist es der Adapter A06045. Wird auf der NMEA2000-Seite ein Stecker benötigt, ist es der Adapter A06046. Was muss verändert werden damit die Windrichtung auf dem es78 stimmt? 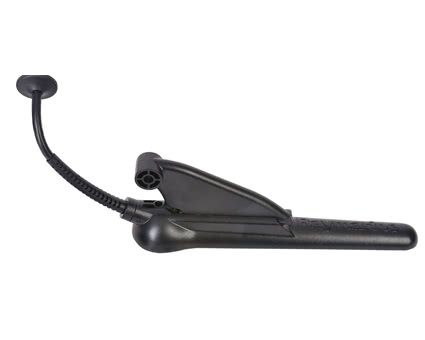 Das ST60 Wind ist über das Seatalk 1 / Seatalk NG Kabel gekoppelt, jedoch wird die Windrichtung nicht richtig angezeigt. Wind kommt aus 180° lt. ST60 und Windex also Achtern, das ES78 zeigt 60° falsch an. Woran kann es liegen? Es wird ein Datenkonverter benötigt, um die Daten korrekt anzuzeigen. Ihr ST60Wind hat als Betriebssprache SeaTalk1, Ihr eS78 spricht SeaTalk-NG. Sie benötigen das SeaTalk1-auf-SeaTalk-NG-Konverter-Kit, dieses übersetzt die Daten des ST60Wind in die Sprache des eS78. Das Konverter-Kit können Sie hier unter der Artikelnummer 85352 bestellen. Sehr einfacher Einbau durch gute Anleitung. Das Gerät selber konnten wir noch nicht betreiben, da noch Winterlager.